← Rural water services after 2015: what vision should replace the MDGs? 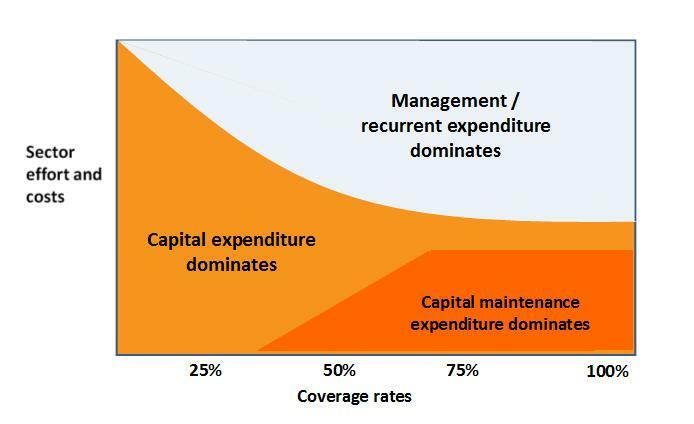 The diagram illustrates how a country needs to redirect its financing for rural water services as coverage (the percentage of the population with access to services) increases. When a country has very low levels of coverage (say less than 30% of the population), capital investment is a priority in order to get infrastructure up and running in the first place. However, as coverage rises above 50%, recurrent expenditure (on operation, maintenance and management support) and capital maintenance (major rehabilitations or replacement of old infrastructure) begin to dominate the effort and finance needed by the sector. 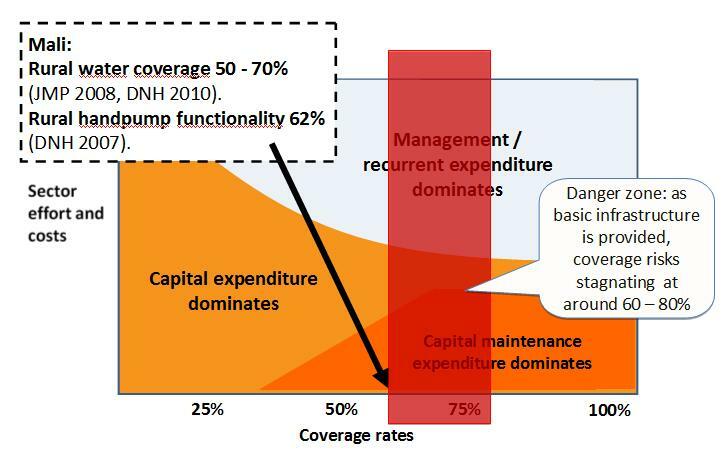 In particular, the Triple-S work has identified a ‘danger zone’ – coverage levels which risk stagnating at 60-80% when there is insufficient attention to capital maintenance and/or other recurrent costs, meaning that old systems fail at about the same rate as new ones are built. Patrick Moriarty discusses here how Uganda has reached this danger zone. Looking at the national figures for rural water coverage, Mali might not be in the danger zone quite yet – but some districts within Mali which have higher coverage than the national average probably do fall in this zone. These areas therefore represent opportunities to understand what costs might be needed at local levels to get out of the danger zone and move towards sustainable services. I’m currently working with WaterAid’s partners in five local government areas to analyse coverage, functionality and costs data, and we hope to share initial findings soon.